Although movies rarely live up to the expectations of a good book, listening to story on CD or iPod can actually bring the story to life. Such has been the experience of listening to Skulduggery Pleasant. Although this series has now been out for a few years, the audio edition by Harper Collins is so brilliant that it deserves to be revisited. Read by actor Rupert Degas, the lilting Irish accents plus the 101 other voices are truly astounding. The story centers around Stephanie, whose Uncle Gordon,a writer of horror fiction dies and leaves her his estate. However, Stephanie learns that while he may have written horror, it certainly wasn’t fiction. Enter Skulduggery Pleasant, a wise cracking detective, powerful magician, master of dirty tricks and burglary,who is also very dead. In the vein of all good fantasy, they are pursued by evil forces intent of controlling their world as they know it. For lovers of Artemis Fowl, this is the next series for you, with a continuation of the wry humour, fast and improbable action loved by so many. Don't be put off by the cover with its evil looking skulls. 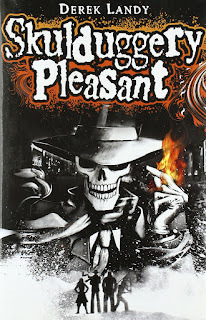 Skulduggery Pleasant fits more easily into a fantasy or even adventure genre than it does horror. The Skulduggery Pleasant series will be enjoyed by 10-13 year old's as well as teens and adults who love a well written fantasy.